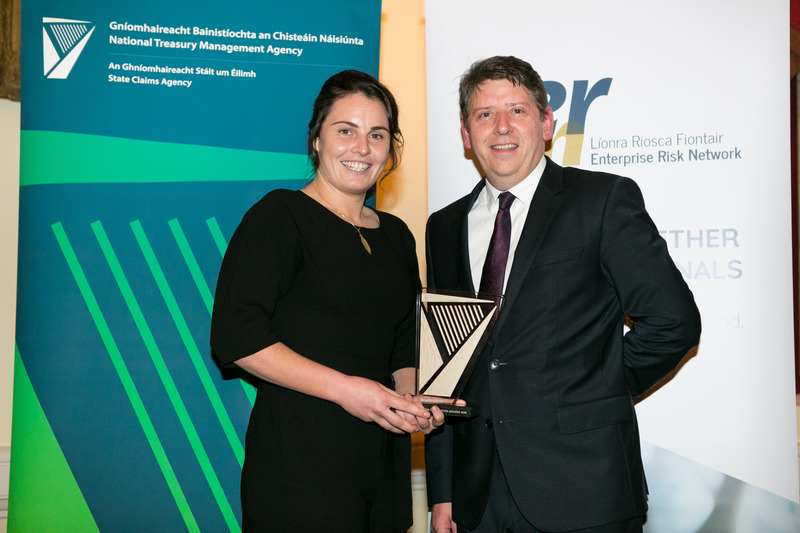 Oberstown has been awarded an Enterprise Risk Network Recognition Award, presented by the State Claims Agency (SCA) at a ceremony on November 8. The health & safety team in Oberstown were finalists in two areas and on the night won the overall award for NIMS (National Incident Management System) incident reporting and investigating, while also coming in the top three for the Oberstown Corporate Risk Register. Katie O’Dwyer, Investigations Officer, Oberstown with Pat Kirwan, Deputy Director of the SCA. The Oberstown winning entry was based on a new NIMS tool to close out on the investigation side of incidents and accidents. The tool, which Oberstown has been using for the past number of months, identifies immediate and underlying causes of incidents and the corrective actions to prevent reoccurrence and allows for tracking of trends in relation to incidents. The Minister for Children and Youth Affairs, Katherine Zappone, congratulated management and staff at Oberstown Children Detention Campus for its success at the State Claims Agency Enterprise Risk Network Recognition Awards 2018. The Minister said: “I was delighted that Oberstown was among the finalists in two categories – the ‘Long Term Value’ and ‘NIMS Incident Investigation’ categories. I understand that there were a large number of initiatives submitted and the standard of these was very high. It is therefore a significant achievement for Oberstown to be the overall winner in the ‘NIMS Incident Investigation’ category. According to the SCA, Enterprise Risk Network Recognition Awards enable risk professionals in state authorities to showcase their work in the area of enterprise risk management and promote positive outcomes that can be achieved by implementing risk management initiatives.